There is a fierce debate amongst people concerning whether or not sweet and savory foods belong together. I imagine this debate is much like the fracas surrounding the polarizing opinions people have about cilantro (It tastes like soap! No, it’s delightful! ), and, to be completely honest, I totally understand why. Then, right around the end of 2005, newly pregnant and completely and wholly averse to all foods everywhere, something happened to my taste buds. At first I was repelled by food, unable to glimpse any food at all without feeling like my stomach was going to violently force itself out of my body. Then, after 100 solid days of nausea, I emerged from my unintentional fast as a timid and cautious eater. Cut to around six months in, my taste buds all out of whack and not craving certain foods so much as certain sensations, and suddenly I could be found standing in the middle of the kitchen, spicy grilled chicken breast in once hand, bowl of vanilla yogurt in the other, dipping meat into what was essentially tart vanilla pudding and imploring people to try this new concoction of mine because, oh, man, it was so mind blowingly good, you just couldn’t believe it. Sad to admit, I ended up enjoying that particular combination of foods on more than one occasion. Five-plus years later, I’ve now developed quite an affinity for the savory and the sweet combined together, though in much subtler form. Though I still don’t see the point of sweetening up a nice, innocent winter squash, I definitely see nothing wrong with letting the sweet mellowness of fruit sit alongside a piece of grilled meat. Peaches, in particular, with their affinity for being grilled, are a perfect companion for savory grilled sausages, and, when sharing a plate with a light and herby side dish, it’s tough to imagine a more perfect combination of savory, salty, and sweet. Well, unless you choose to eat this, of course. Or this. 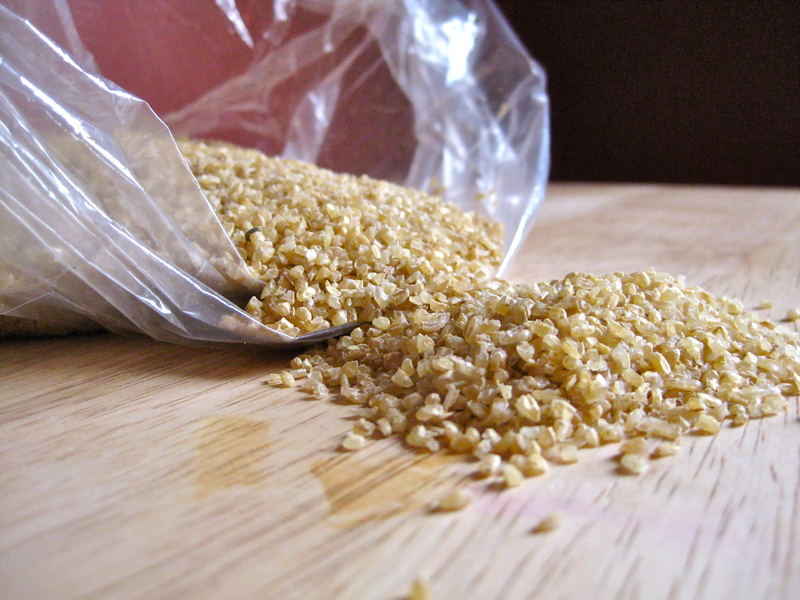 In a medium bowl, combine bulgur with boiling water. Stir to combine, then cover tightly and allow to stand for 30 minutes. Heat an outdoor grill or a grill pan on top of the stove to medium high heat. Brush the surface of the grill with vegetable oil. Place peaches on the grill, cut side down. Place sausages on the grill. 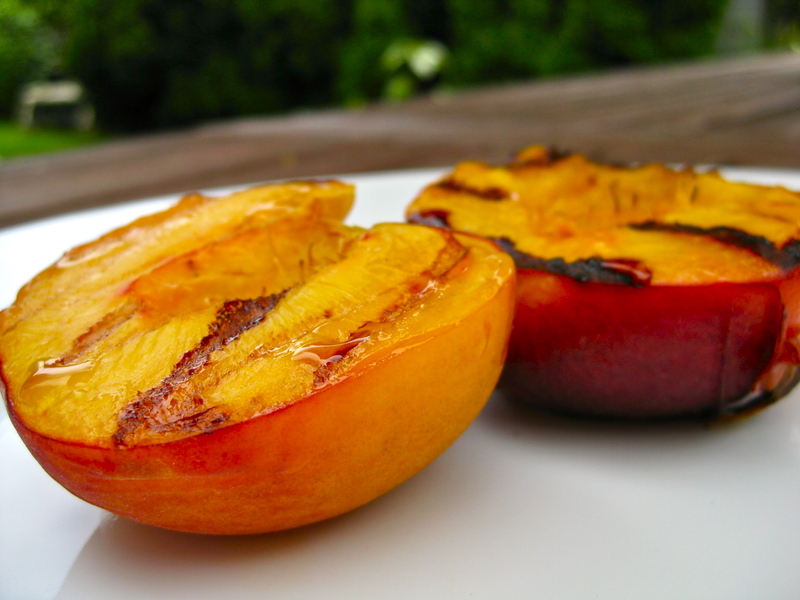 After 3 minutes of grilling, gently turn over one peach to see if grill marks have formed. 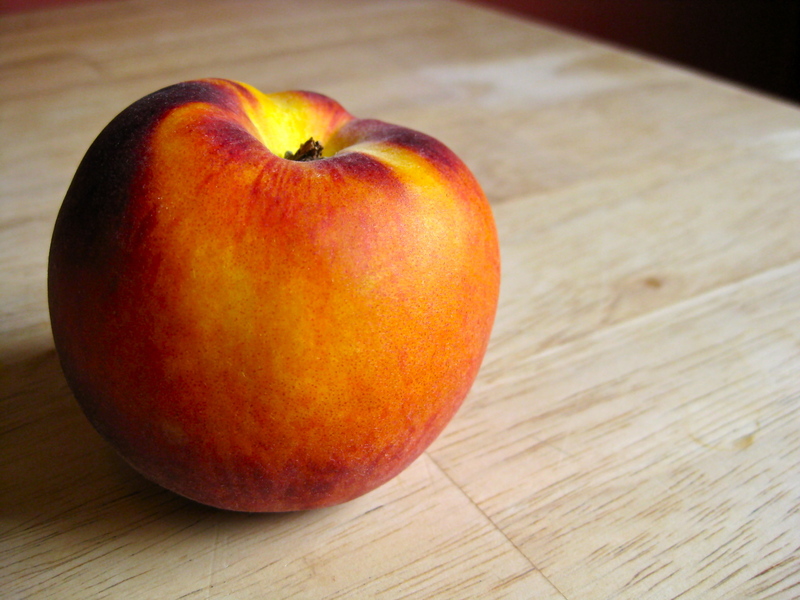 If grill marks are visible, turn over the remaining peaches, and continue to grill for another 3-4 minutes, until peaches appear juicy and soft. 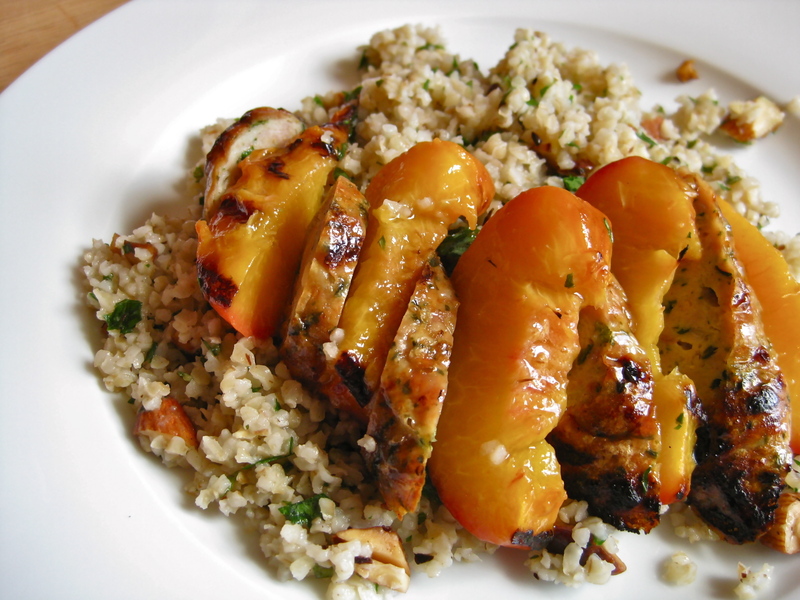 Remove peaches from grill, and continue to grill sausages, turning occasionally, until they are cooked through. 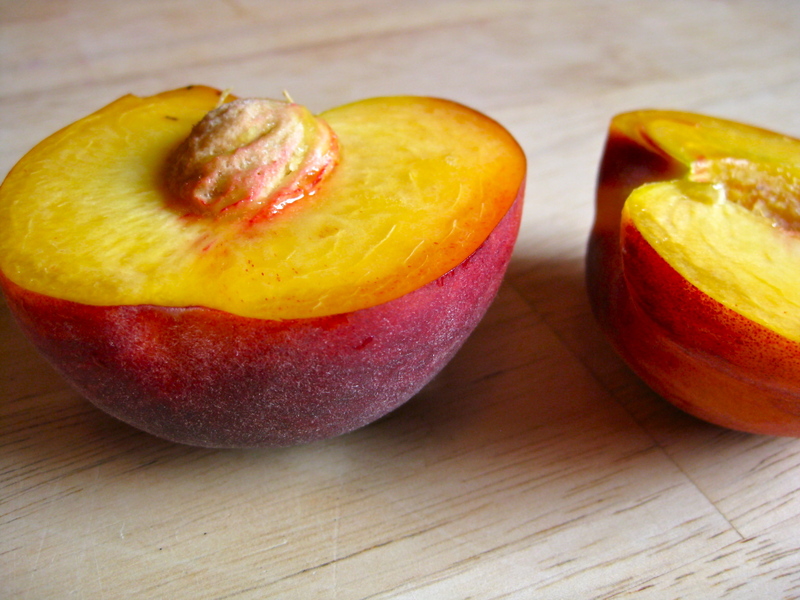 After being cooked, both peaches and sausages should be removed to a plate and covered. When bulgur has soaked for 30 minutes, fluff with a fork and taste for doneness. Bulgur should be soft and fluffy in consistency. Drain bulgur in a fine mesh sieve to remove any remaining water, then return to the bowl in which is soaked. In a small pan, heat butter over medium low heat. 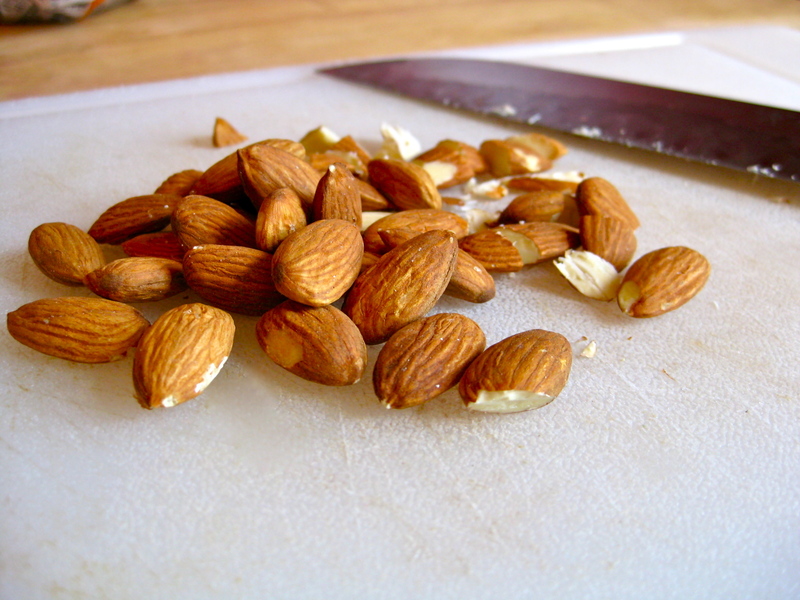 When butter has melted, add chopped almonds and gently fry in butter, stirring occasionally, until almonds have started to brown, about 3 to 5 minutes. Add almonds to bulgur. 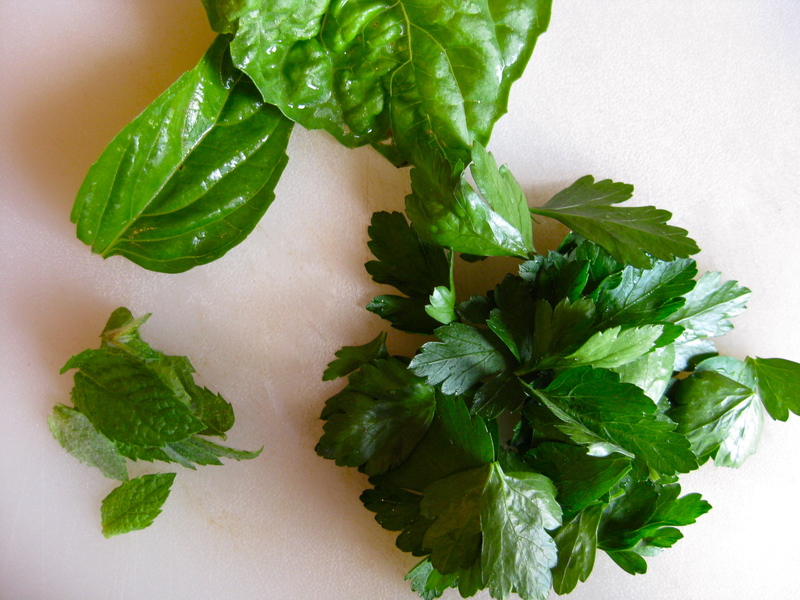 Add chopped herbs to bulgur. Add salt and pepper to taste, and toss to combine. To serve, slice each sausage on the diagonal into oval coins. Slice each peach half into fifths. 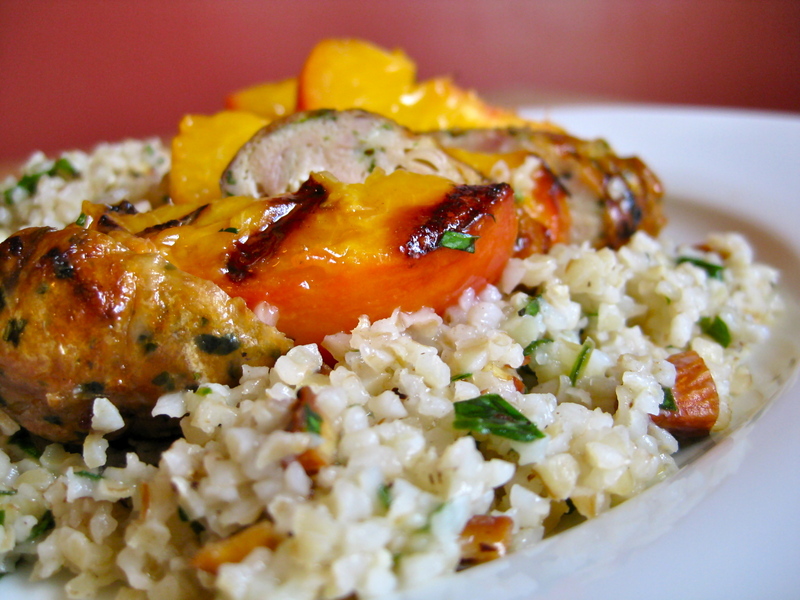 Serve peaches and sausages on top of bulgur, pouring over any juices that collected on the bottom of the plate on which the peaches and sausages were resting. ← Is Anybody Else Mildly Disturbed/Fascinated by This? Looks amazing. I love grilled peaches. Sweet and savory can be tricky, but when done right, like this, so amazing.